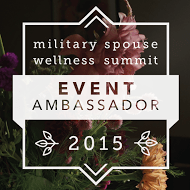 I am so excited to be an Ambassador for the first ever Military Spouse Wellness Summit. It will be held from 19-24 October and it is all online, which means if you work, have kids or have a busy week you can still find time to attend at your connivence in the comfort of your home. The summit will bring 10 wellness expert interviews to help you thrive. During the week the conference’s goal is to help you Invest in Yourself. Military Spouses are conditioned to give and give without asking for anything. This conference will help you continue to serve others, but also take care of yourself. The event will start Monday 19 October and will wrap up on Saturday with the announcement of the winners for the great prizes being given away. Each day you will receive a link to the two talks for the day and on your own time will be able to view them. The only way you can view the links and get them in your inbox is to sign up. So register here*. What topic do you hope the first ever Military Spouse Wellness Summit will cover? Such an important thing for so many woman. Way to go Amanda!